Can I please have a dragon? Jeremy Thatcher, Dragon Hatcher is a story about a boy (Jeremy) who buys a dragon's egg and hatches. Afterwards he must raise the dragon, who becomes his best friend, and eventually send the dragon home. This is a great book, like The Monster's Ring, you have a protagonist who deals with bullys, parents, and teachers. Jeremy must learn to care for his dragon, while protecting the family pests as she grows, and keeping her existence a secret. It dosent' help that a girl in his class has made it her goal to track him down and kiss him! Jeremy learns responsibility and sometimes doing what is best for someone else may not be the easiest thing for you to do. HMMM....sounds like a parenting lesson there. Anyway, it's a great summer read full of laughter and excitement and of course dragons. Farley Follows His Nose is a picture books based on Farley from For Better for Worse. It's about time! Farley goes through the day, after his bath, chasing smells. He goes across town and even gets lost before returning home. During the day he helps a little find his way home. It's a sweet book with artwork reminiscent of the comic strip. I enjoyed following Farley following his nose. It has some repetitive words for the enjoyment of little people. Big bright colorful drawings. 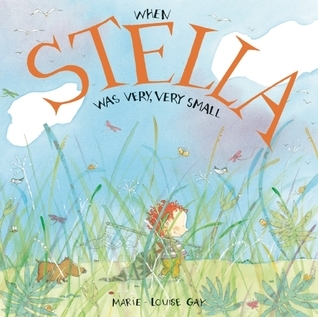 When Stella was Very Very Small follows little Stella as she learns about her world. Her imagination transforms her world into amazing experiences. In the end she grows up and begins teaching her very very small brother Sam all she has learned. This is a sweet, yes I used that word again, book. The artwork looks like watercolor. I love the drawing of Stella this tiny little red-haired girl. She is adorable. I love her vivid imagination and how she sees everything differently. It's a great book for small kids. 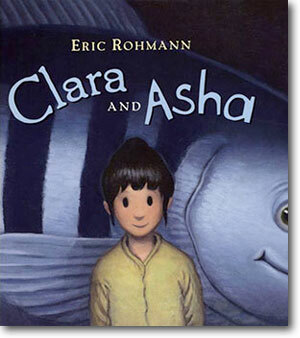 Clara and Asha follows Clara through a dream like world with her friend Asha. Asha's a giant fish. But that doesn't stop the pair from having amazing adventures. This is a true picture book. Beautiful dreamlike artwork with few words. It is a treat for the eyes. I loved searching the pictures to find any hidden object. Not that it has hidden objects. It's just that the artwork is amazing and deserves searching. Loved this book and will read it again before I take it back to the library. I was about to start reading Jeremy Thatcher, Dragon Hatcher, when I saw it was book 2 in a series. So, of course, I looked for book 1 and checked them both out. The Monster's Ring is book 1. I will be returning to my dragon books shortly, don't worry. The Monster's Ring is about Russell Crannaker. A elementary student who is bullied by a bigger boy, smothered by his mother, and not listened to by his father. Poor kid. While escaping from the bully he wanders into a magic shop. The shopkeeper sells him a ring, he didn't know he needed. What follows is a tale of not following directions and learning to stand up to a bully, as well as standing up for that same bully. Of course Halloween, a full moon, and talking rats have a part to play. I loved this book. I loved that this boy stood up to a bully. I loved that he had compassion to want to help the bully out when he needed it, and I loved that he learned to fly. It's a fun, quick read. There are plenty of parts kids would love. Like turning in to a monster for the school Halloween party and pouncing at the principal, and the streaking scene at the end (pun intended, relax it's a clean book). This probably a boy book, but I have a feeling girls will like it as well. I plan on handing it to mine after I write this up. She'll love it. OK, technically a Basilisk isn't a dragon, but it is close enough. When I saw the cover of this book in the library, I thought it looked cute. I loved the title, too. I couldn't find the first book, so I started with book 2. The Basilisk's Lair, follows Nathaniel Fludd as he learns to be a Beastologist. His Aunt Phil is the current Beastologist. They receive news that the Basilisk has escape and must chase him down and capture him before he destroys surrounding villages. Nate is a fun character. He has weaknesses, he's not real sure of his abilities, but when the chips are down you can count on him to pull through. He has a pet gremlin named Greasle, who has an attitude. The story is fast paced and descriptive. The drawings are fun. They look like pen and ink drawings and add to the adventure of the story. I really like the bones that mark the beginning of each chapter, they increase as you read! For those of us that need one, there is also a glossary to explain words, people, and places. I must say, this is not the same sort of Basilisk from the Potter books. This one is somewhat...ridiculous. It's a great summer read and I look forward to reading the other books in the series. 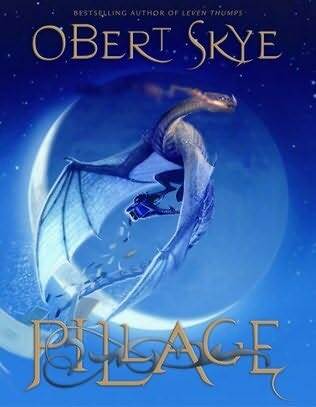 favorite quote: "I had fallen from vents, scaled buildings, and flown on the backs of dragons, yet somehow all of those things seemed a bit less amazing now." I went to the library, trying to avoid the summer rush of kids once school gets out. I never made it to the adult section. The children's section held my attention and when I left books filled my bag. Oddly enough, most deal with dragons. Except for one, it had dinosaurs- same thing. Pillage, is book one in the Pillage Trilogy. It's a short, fat book with a beautiful picture of a dragon carrying a postal box dripping with letters. Anyway, the basic story is Beck, a teenage boy, is moved to his uncle's house after his mom dies penniless. Beck has had a rough life and it only gets rougher...and odder. He notices he has the ability to command plants and finds these odd rocks in his uncles garden. A garden his has been forbidden to enter. Through a strange turn of events and secret passageways, dragons hatch. Beck must save the town and break an ancient family curse all at the same time. I really enjoyed this book. I loved how each chapter started with an excerpt from an ancient text describing the fate of Beck's ancestors. It's a very quick read. The pages magically fly by. It's a lightweight fantasy, meaning it has magic, dragons, and curses but no epic worlds full of unusual creatures and languages. It's a good first fantasy book. The writing is crisp and witty. Beck sounds and acts like a teenager. The first chapter is brilliant! Lynne Cherry has a long list of environmental books for children. The Sea, the Storm, and the Mangrove Tangle, follows the life of a mangrove seed from pod to mini ecosystem. It shows the link between the mangroves and the animals that live within the branches and roots. It also shows the protection the groves give during storms. This book is beautiful in its story and illustrations. The cover pages are have a beautiful map of the world locating the areas where mangroves grow. It also illustrates the animals that survive because of the mangroves. This book is a beautiful learning tool. I highly recommend it to parents and teachers alike. Summer is here and many are making plans to visit the beach. When a Dragon Moves In, is a story about a little boy who builds the perfect sand castle. Of course if you build a perfect sand castle a dragon will move in. The little boy has fun with his dragon, until he gets the little boy in trouble. I loved this book. The illustrations are bold, bright, and colorful. They follow the story beautifully. As the child reads, or is read to, the illustrations tell a secondary story. It is funny and brings back memories from my own childhood. I could have used a dragon! It's a perfect read for summer. ++ Didn't finish, not my cup of tea. + You really don't want to know. I am a wife, mother, quilter, reader, writer, blogger, baker, and everything under the rainbow. This is my journey through fiber. Welcome to my blog. This is a diary of what I am reading with a little insight or review. I love to read everything from history, mystery, children's, and everything elase. Hang out, grab a cup of coffee, and let's talk books.